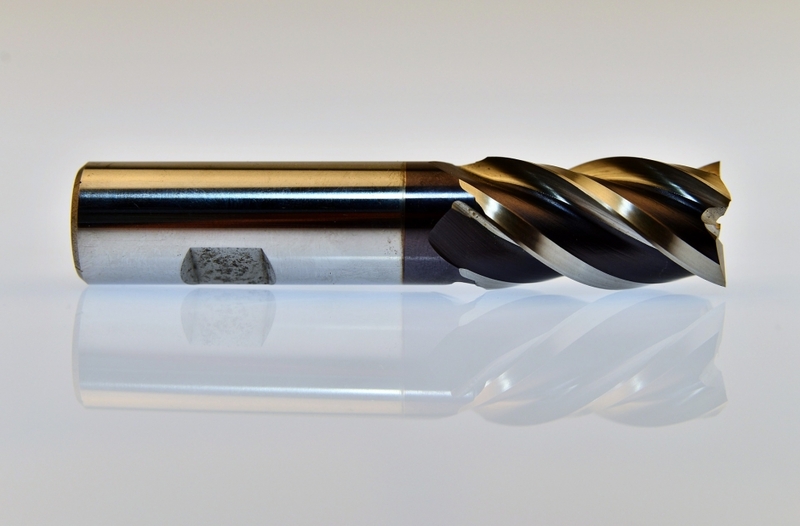 Diamond-like carbon coating, otherwise known as DLC coating or amorphous carbon coating, is the name given to a range of thin-film hard coatings used to protect, strengthen, and enhance various parts from drill bits to the engines of racecars and medical devices. DLC coatings can be applied to nearly all metals, metal alloys, and also on nonmetals such as silicon, glass, ceramics, plastics, and others. Though it is only “diamond-like” carbon, the coating does have some of the properties of its namesake including extreme hardness, resistance to wear/scratches, chemical inertness, low friction, lubricity/smoothness, and electrical insulation. In this article we look at DLC coating and how it works, as well as the range of applications which use it. We also provide a list of DLC coating specialists in the United States. Though it is called “diamond like”, the coating is not actually like naturally formed diamond. Diamond and graphite are both allotropes of carbon; they are also formed of carbon atoms, however, these atoms bond together into different structures, causing them to have different physical forms. In diamond, carbon atoms are bonded together in tetrahedral lattices (a cubic crystal structure), while in graphite they are bonded in hexagonal lattices (like honeycomb). In amorphous carbon coating, the carbon does not form a regularly repeating structure. Instead it is a combination of both the diamond and graphite structures – the cubes and the honeycombs – jumbled together across a surface. Though it feels smooth, under an electron microscope the surface is like cobblestone, where nodules of diamond-bonded carbon make up the cobbles, linked with honeycomb lattice. What this all boils down to is this: DLC coating has the hardness of its diamond constituent, the lubricity of the graphite, and a mix of other properties besides. Its most valuable properties are: Hardness, lubricity, abrasion resistance, chemical inertness, and electrical insulation. 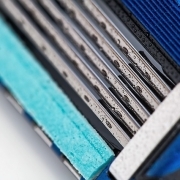 Razor blades use DLC coating to improve friction, reduce wear, and extend lifespan. Automotive engine applications – DLC coatings are used to enhance engine components to improve mileage and decrease wear. They are used for fuel injection and internal engine components to reduce friction and wear. In racecars the difference is enough to boost horsepower markedly. Medical applications – Medical device and instrument manufacturers use DLC amorphous carbon coatings to reduce sliding friction and eliminate galling of medical devices and instruments. Bone saws also use DLC coatings to reduce bone necrosis by improving the quality of the cut (due to the low friction) and increase the saws’ working life. Molds and extrusions – Extrusion dies and molds use DLC for the low friction and corrosion protection it provides, which eases release of the components. Industrial components – Manufacturers use DLC coatings to extend the useful life of their packaging knives, compacting tooling, press tooling, and wear surfaces. Decorative applications – DLC coating is popular on luxury watches. It provides superior durability and wear resistance, while giving a shiny black aesthetic. Firearm coating – Increased wear resistance and low friction protects both the external surface and internal components of guns from abrasion generated by use. It also reduces the need for lubrication while preventing catching or grinding. Broadly speaking, the deposition methods for diamond like carbon coatings can be divided into two types: Physical Vapor Deposition and Chemical Vapor Deposition. Within these two categories there are different exact processes which result in different coating properties. Physical vapor deposition uses solid carbon in the form of graphite as its source of carbon. The PVD method is further divided into the arc, sputter/plasma, and laser vapor deposition methods. The solid substance, in this case graphite, is vaporized through the application of high power electricity, laser, or evaporation and then forms a thin layer on the target substrate. No chemical reaction takes place, the deposition is formed by condensation. PVD is what is known as a “line of sight” technique, so it is difficult to coat surfaces that include undercuts or features that are not easily visible. It also has a slow rate of coating deposition. Chemical vapor deposition uses a hydrocarbon gas such as methane as its source of carbon. The CVD method includes radio-frequency (RF), direct current (DC) discharge, Penning ionization gauge (PIG), and self-discharge methods. Unlike PVD, in CVD a chemical reaction takes place; the ‘precursor’ gases/carrier gases in the deposition chamber react when they come into contact with the target substrate, causing them to form a solid which is deposited on the substrate. The benefits of CVD are that the deposited coatings are conformal (it is not line of sight), have a high growth rate, high purity, and it can deposit hard to evaporate materials. There are companies across the US that specialize in PVD and CVD processes which are capable of applying DLC coatings to a range of parts and projects. Below we have compiled a list of just a few of these local specialists. If you need DLC coating for a project, get in touch! Our experts are here to help. Just use the “Request a Quote” button beneath this article and tell us about your project and its requirements and we will connect you with the right coating partner for the job.